From the time that the $30,000-to-win Toyota Tundra 250 was announced last summer, there was one name that kept coming up more often than any other as the potential winner. It wasn't five time track champion Scott Chubbuck, four-time PASS North champion Ben Rowe, Maine Racing legend Mike Rowe or PASS South point leader Corey Williams that kept getting mentioned though. It was Johnny Clark. To Clark, Wiscasset is his second home. He's won two of the last three PASS North races there. He won his first career PASS North race there too. He hones his skills on many off-weekends on the Tour by showing up to take part in the track's weekly racing program. Still, the amount of pressure that comes with being the favorite can be crippling. Clark admits that he felt it leading up to Sunday's race, but it didn't let get to him. Just like many predicted, Clark did in fact win the event. 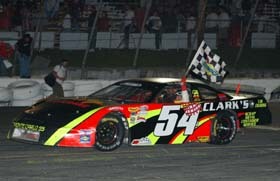 Clark knew that was a possibility after growing up watching another Maine racer, Jeff Taylor, win nine track championships and 69 races at Oxford Plains Speedway, but get shut out of winning the track's marquee event - the TD Banknorth 250. He just hoped that his own outcome at Wiscasset didn't parallel that pattern. Had it actually been a 50 lap though, there would have been someone entirely different than Johnny Clark cashing the winner's check. Corey Williams ran away and hid from the field early in the racer with his #47 car, leading from the start through his pit stop on lap 110 - when his team was able to change tires and also fix a sticky throttle. from the field and stretched his lead to a full straightaway. later than he wanted to. from the gameplans that his competitors had followed. Clark wasted no time getting back to the front. Within 25 laps, he was in the lead again. 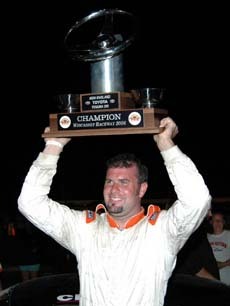 Johnny Clark shows off the winning hardware for winning at Wiscasset. Meanwhile, Williams was coming back as well. A defective tire on his first pit stop, turned his car into a flounder that struggled to stay in the top 10. But a final tire change brought it back to life and as the race neared completion, Williams was coming through the field and gaining on Clark. Williams got to Clark's bumper for a green, white, checkered finish, but there was no drama behind that. Clark wasn't going to let him get by and Williams never really had a chance to either. 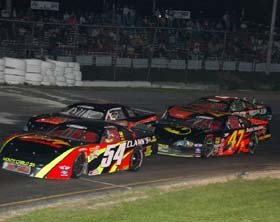 Finishing behind Clark and Williams were Steve Knowlton, Scott Chubbuck and Randy Turner. Speed51.com will wrap up our Wiscasset coverage with an upcoming edition of our leftovers coming soon.